Most of the time you don't want to hear "viral" and "CDC" in the same sentence. Unless we're talking in non-medical terms. The blog has given @CDCEmergency a big bounce on Twitter. The account is now approaching 1.3 million followers. It reportedly had just 12,000 as of Thursday. Now that the CDC has captured our attention online, will it be able to keep it? Not unless something changes. The newly popular @CDCEmergency tweets less than once a day on average. It would to do well to look at another government agency for lessons. NASA has the most successful social media presence. Yes, there's a study to back up that claim. NASA has been on Twitter for years. The U.S. space agency now has more than 100 feeds, according to a tally by Mashable. It has used those accounts to engage the public and humanize the space program. Tweet a question to @NASA and you'll probably get an answer. Or you can talk directly to an astronaut. The very first tweet from space was sent by @Astro_Mike in 2009. Right now, five of the people in space are also on Twitter. NASA also offers ways to "connect and collaborate" via other websites. Its creative approach could be a matter of necessity. Most people would agree it's a good idea to prevent disease. But space is a divisive subject... even here in the newsroom. During last week's launch, some of us wondered what things would be like if interplanetary internet had been around a decade earlier. Would we have more people like this? NASA is about to face something scarier than the walking dead: the end of its space shuttle program. Atlantis is currently set to launch on July 8, bringing an era of spaceflight to an end. NASA will select 150 of its Twitter followers to attend the event. The Tweetup will be a fitting finish. NASA's first Tweetup at a shuttle launch also saw Atlantis liftoff. That was in 2009. You can register for the final hurrah here on June 1. That is amazing growth for a Twitter account. Moving from 12,000-1.3 million followers in just a few days. 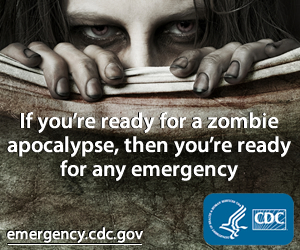 All because the CDC tapped into the zombie market. It just goes to show how using relevant content can transform a name that has been around for years, overnight. What will they have to do next? Mention they found aliens on the last shuttle mission that have the secret to Area 51. Whatever they do, just learn from it from a marketing standpoint. Visit Content Zombies for help with your marketing.